As a kid (well, and adult) I’ve always enjoyed my fair share of gummy candies. And let’s go ahead and admit this now, most of us tended to bite our gummy bears’ heads off, or as kids, we pretended to have gummy bear vs. gummy shark battles. So when I heard about A Gummy’s Life from the team at EP Games realizing those battles into a fighting party game for the Nintendo Switch, I bounced (here and there) at the chance to play this. 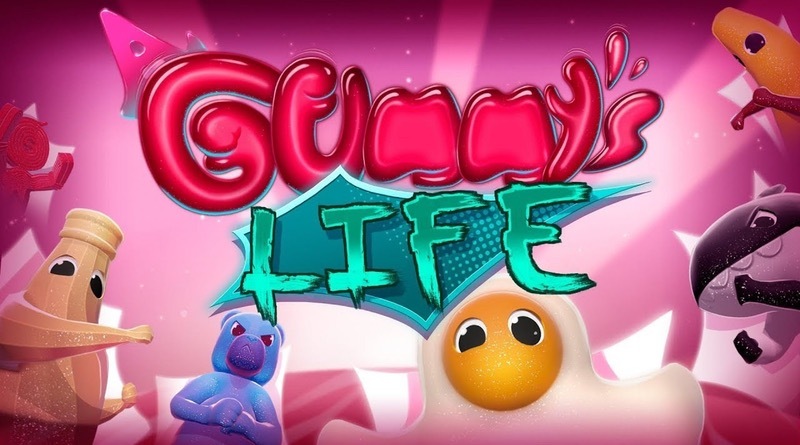 A Gummy’s Life is a standard brawler that supports up to 8 players either local, online, or with AI substitutes. The game is centered with a cast of gummy characters that take on all of your favorite gummy forms including the: gummy ring, gummy bear, gummy shark, gummy cola bottle, and quite a few more. On top of this, every gummy has a selection of different colors and styles such as a sour sugar coating to choose from. Each gummy is also is comprised of 3 stats that give a slight differentiation as to their fighting capability, but in my time playing, I never noticed any significant changes, or really figured out what each of the symbols fully meant. This brings up a key problem area with the game in that although it is a very simple game in nature, there are no tutorials, no descriptions, and practically no UI elements, save for a “Press +” icon used in a couple of areas. I immediately was confused even trying to change characters as the selection was not intuitively mapped. I’d advise checking out the Options menu prior to playing to see what combat controls are set up as. In this day and age of no instruction books, developers need to be vigilant in explaining every facet of the game via tutorials or at least nudge the player in the right direction through gameplay. The game does offer a Training Mode, in which I thought I would be instructed more on what to do in combat, but unfortunately this mode was devoid of any instruction whatsoever, and after playing the game’s main modes, I found it to be a very unnecessary addition. Jumping into the big Play button on the Main Menu opened up the game’s setup screen that detailed the different maps, game settings, and modes including: Free for All, Team Deathmatch, King of the Hill, and Hot Potato. However, after playing several rounds of each mode, the rules for King of the Hill and Hot potato still weren’t immensely clear to me due to a lack of any instruction or goals. When you do select a mode, you’ll generally have up to 15 maps that you can play in. I really enjoyed the design of several of these maps as they each include either obstacles or a mechanism to further deter your combat. For example, you can play on a giant clock face, and during the match, the entire face will drop off only leaving the numbers for your character to stand on. At that point the game actually evolves into a jumping/timing match, where the clock’s hands start spinning around faster and faster until someone is knocked off. It’s a great design to mix up what is generally monotonous gameplay. However, I also felt that while almost all of the maps were clever in design, they did nothing to reinforce the idea of a gummy world, or anything gummy related. The art style failed to reinforce anything gummy as well and generally felt a bit bland artistically. Combat in A Gummy’s Life is comprised of hitting, kicking, head butting, and on occasion, tossing another gummy around. The game utilizes physics based combat, which can become clunky more often than not. I continually found it difficult to tell if I was actually hitting another gummy, or if they were hitting me, again, primarily due to absolutely no UI such as health bars. The only visual identifier to hits taking place was that sometimes a gummy would spurt out a gummy-juice substance onto the ground. This is another area where I would have loved to seen the game really embrace the gummy fiction, and have bites or chunks of each character taken out as you lost health. This ends up being the extent of A Gummy’s Life. You’ll take on fairly lifeless brawls against opponents repeatedly with no progression or goals to be accomplished. This makes the game best played in short spurts; a few rounds here and there at a party perhaps. The game does offer a couple of gummy characters that are locked, but then fails to explain how they can be earned. After several hours of playing, I hadn’t unlocked any of them. I went into this game hoping for a fun, lighthearted gummy-centric world ripe with opportunities to really capitalize on the fiction of gummy characters fighting. I left having played a fairly generic physics brawler. Regrettably the game wouldn’t change at all if you replaced the gummy’s’ with farm animals, aliens, or anything else. There just isn’t anything keeping a cohesive world together, and that coupled with no UI, and a lack of any instructions left a not-so-sweet taste in my mouth. A Gummy’s Life fails to bring the gummy fiction to life on almost all counts apart from the characters. With no combat feedback and UI, punches and kicks felt non-impacting and lifeless in the physics brawling. While the game is fun for a few minutes at times, a lack of progression or goals keeps this title on a very short lifeline. The MSRP of $14.99 just feels too steep for this game’s offerings.